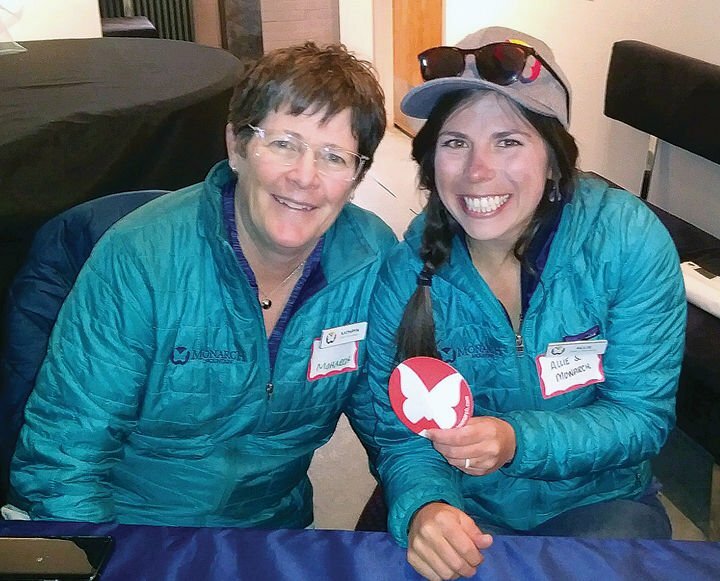 Kathryn Wadsworth, left, and Allie Stevens of Monarch Mountain celebrate the transition from winter activities to summer ones at the Heart of the Rockies Chamber of Commerce Kickoff to Summer event Wednesday at Salida SteamPlant. 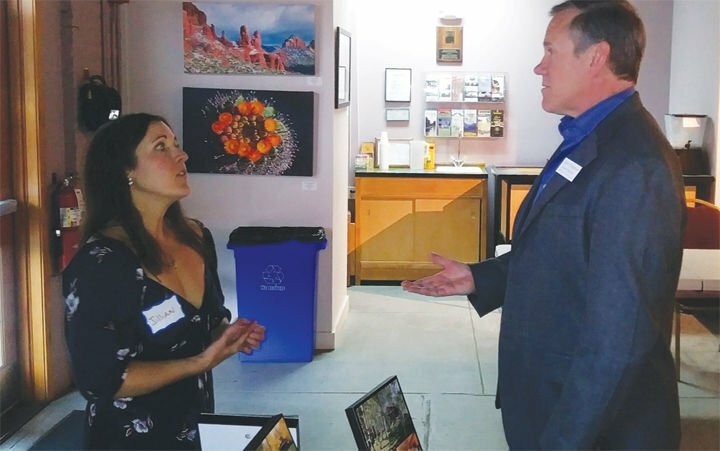 Jillian Chernofsky, left, of Creekside Chalets and Steve Chapman of Salida Walking Tours discuss their plans for the summer at Heart of the Rockies Chamber of Commerce Kickoff to Summer event Wednesday at Salida SteamPlant. Wintry weather didn’t dampen spirits at the Heart of the Rockies Chamber of Commerce Kickoff to Summer Wednesday at Salida SteamPlant. A total of 46 vendors plus about 75 attendees gathered to talk about the upcoming summer season at the trade show event showcasing area summer activity businesses. Lori Roberts, chamber executive director, said everyone was asking good questions and very engaged. Roberts said the vendors are the reason people keep coming back to the event. Roberts said the chamber likes to give back to the community, and the kickoff is one of the ways it does that. Chernofsky said she likes winter, but there are more options for outdoor recreation in summertime. Creekside Chalets has updated its cabins with new furniture and lighting, Chernofsky said, as well as improved landscaping. “We’re still here for fun. It’s going to be a good summer,” Chernofsky said. Kathryn Wadsworth of Monarch Mountain said she was happy Monarch got a lot of snow this winter, which means the river will be great this year. Kaelen Peuser, Wood’s High Mountain Distillery general manager, was handing out samples of whiskey, gin and elderflower liqueur. She said she found a receptive audience, and people were enjoying the tasting. Peuser said she likes the kickoff because she gets to meet new people and see members of the community she hasn’t seen in a while. “It’s kind of not summer, but we’re excited for summer,” Peuser said.